We have been visiting the Piedras Blancas rookery of northern elephant seals (Mirounga angustirostris) since early 1991, when it was newly colonized by animals from the San Miguel, San Nicholas and Ano Nuevo rookeries, and have watched it grow to its current size. We have had the good fortune to witness many marvelous animal behavior spectacles in our travels, and the breeding activities at the Piedras Blancas elephant seal colony rank right up there with the finest wildlife viewing anywhere in the world, especially now that the colony is so large. The fact that it is a short drive from San Luis Obispo and Morro Bay, only yards from Highway One, and affords one a visit to Piedras Blancas Lighthouse, Big Sur or Hearst Castle in the same day, make it really special. 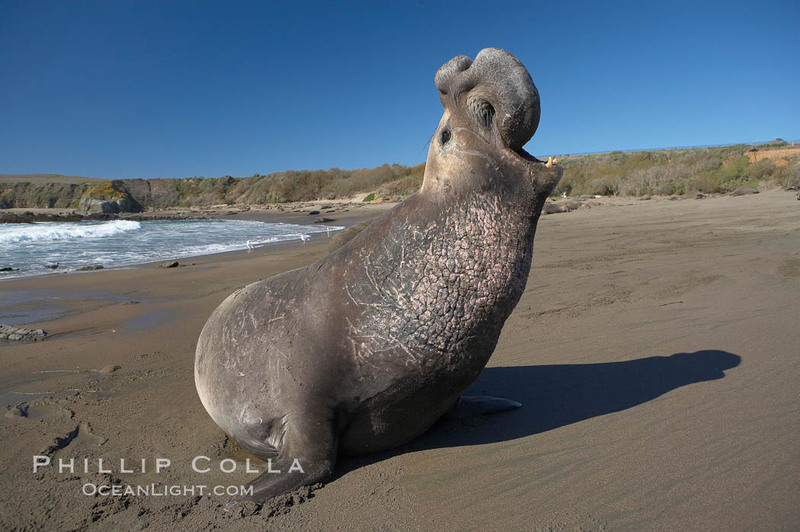 Click here to see all of our elephant seal photographs from Piedras Blancas. Elephant seals are the largest of pinnipeds, reaching 16 feet in length and 2.5 tons. The southern elephant seal is just slightly larger than the northern species. They are phocids, true seals, characterized by the lack of external ear flap and moving on the beach by flopping along on its belly. They propel themselves in the water with their hind flippers and use their foreflippers primarily for steering and crude dexterity. The elephant seal is notably characterized by its enormous proboscis (enlarged nose), which in adult males grows about a foot in length and hangs over its mouth. Adult elephant seals generally live to about 12 years. Mortality is high among young elephant seals, due to trampling and separation while young, and due to the rigors of weaning and learning to survive independently. The only significant predation upon elephant seals is by great white sharks and orca (killer whales). Range. Northern elephant seals range from the Gulf of Alaska and the Aleutian islands south through California and into Baja California. In general they are oceanic animals, spending 90% of their lives in the ocean, living up to 5000 miles offshore and diving to depths in excess of 5000 feet in pursuit of deep water prey such as squid and bottom fish, generally spending only 4-5 minutes at the surface between foraging dives. Males, who have higher nutritional needs than females to sustain the several month fast they maintain during the breeding season, forage closer to shore along the continental shelf and have a more varied diet than the females to account for it. Females tend to forage beyond the edge of the continental shelf in deeper water. They are one of nature’s champion divers, exceeded perhaps only by the sperm whale. History of the Northern Elephant Seal. Elephant seals were hunted heavily in the 1800’s for their fatty blubber which was rendered into high quality oil for machinery, lamp oil and paint. They were driven onto beaches and beaten. By the late 1880’s they were nearly extinct, so much so that sealers could no longer locate them and switched to hunting other species. A small holdout colony at remote Guadalupe Island off Baja California, Mexico remained, from which all northern elephant seals today are descended. (A similar survival situation was observed in Guadalupe fur seals, whose numbers were even fewer and who today are recovering but at a slower pace.) This genetic bottleneck is a concern since the entire population has only the genetic variation (and potential weaknesses) of a few dozen animals. The species is recovering, growing about 6% each year and moving northward to reoccupy historical colonies and create new ones along the Pacific coast of the United States. It is estimated that their population is now between 120,000 and 150,000 individuals. History of the Piedras Blancas Colony of Elephant Seals. Historically, elephant seals have not colonized the Piedras Blancas coast, so the formation of this significant rookery is a relatively new and notable development. The growth of the Piedras Blancas rookery has been quite strong, to the point where it now stretches for almost four miles from its northernmost to southernmost points and hosts over 15,000 northern elephant seals during the course of the year. It began in late 1990 when a few dozen elephant seals were observed on the brown sand beach south of the Piedras Blancas lighthouse. The following spring, several hundred were observed to come ashore for their annual molt. It is felt that these animals colonized the Piedras Blancas coast because of overcrowding and failure to reproduce successfully at other locations. Remember, the northern elephant seal population has been on a steady increase since it was nearly wiped out in the late 1800’s, so it is natural for existing colonies to exceed their capacity and for new colonies to arise. During the mid-1990’s, individual elephant seals had begun to move up the bluffs and onto nearby Highway One, creating a traffic hazard. Visitors would pull off the road for a better view of the elephant seals, causing a parking problem and trampling the vegetation of the coastal bluffs and sand dunes. In recent years Highway One has been realigned away from the elephant seals, parking has been made available to visitors, and through the generous work of the Friends of the Elephant Seal a large boardwalk and interpretive exhibit was built offering superb viewing of the elephant seals just yards away. Most recently, a land trade was made between the Hearst Ranch and the State of California to place sensitive lands west of Highway One in public trust, including the entire Piedras Blancas elephant seal colony. Seasons of the Northern Elephant Seal. Although Northern elephant seals are oceanic animals and as individuals spend the majority of their life at sea, as a population elephant seals utilize the Piedras Blancas colony nearly year round. There are two principal reasons elephant seals come ashore: molting (shedding their fur coat) and birthing/breeding. From April through August the elephant seals return to shore to molt, with females and juveniles molting first followed by subadult males and finally adult males. By August they are gone, back at sea with a new coat of a fur. In fall, immature animals will haul out to rest, younger animals appearing in September and older animals later. However, in general these immature elephant seals, typically weaners, yearlings and subadults, do not stay into the breeding season, generally leaving by late November to make way for the older animals. Breeding. Elephant seals are polygynous, meaning that males will attempt to have more than one female mate at a time. Sexually mature male elephant seals return to the colony in late November and December. These include the huge beachmasters, up to 16 feet long and 2.5 tons, powerful individuals who will compete among themselves to establish beachhold territories for harems of females. Bull elephant seals will rear up, bellow and try to intimidate one another. Often one of the bulls will back down or move out of the territory, and they both resume resting. However, if neither backs down they will approach each other and rip into each other with massive, savage bites. These spectacles are fierce and brutal battles, resulting in massive scarring of the bull elephant chest to the point that you can easily identify a beachmaster bull elephant seal by its bloody and scarred neck and chest. Ultimately, each of the victorious bulls will have established a territory within which he may assemble a harem of 30-40 females. The males will fast during the breeding season, remaining ashore to protect their territory, and will attempt to conserve energy by not fighting whenever it is politically possible. 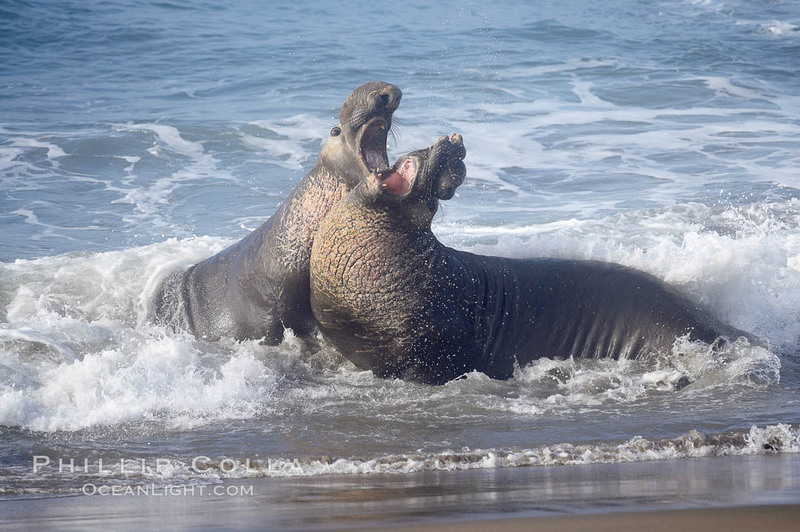 Competition continues through the season while the sexually mature male elephant seals are in residence, ebbing and flowing with natural shifts in territory and harem composition and with newcomers displacing tired beachmasters if the opportunity presents itself. Birthing and Pups. In December females return to the colony and form harems around the males. Elephant seals are highly sexually dimorphic, meaning the males and females differ in size considerably. Female elephant seals are much smaller than the males, up to 10 feet in length and weighing one ton. Generally within five days of their arrival at the colony from eight months at sea, the females give birth to a single pup that they have been carrying since the previous breeding season. Births are usually first observed in late December and continue increasingly through February, peaking near mid-February. Often seagulls will be the first to detect a new birth, flocking to the birth to feast on the discarded placenta. Vocal bonding between the pup and mother is critical and takes place immediately as this is the only certain way the mother and pup can identify one another if they are separated, which is a common occurrence on a crowded beach and beside 5000 pound males that do not hesitate to trample and push the pups aside while mating or fighting. Orphaned pups are commonly observed, usually through separation with their mothers or by virtue of a mother than is insufficiently mature to understand how to care for its pup. Some mothers who have lost their pup will attempt to steal another female’s pup. Some mothers will also tolerate an orphaned pup nursing, although this may actually doom both pups as it is thought that a mother only has enough milk supply to properly nourish a single pup each season, since for each pound that a pup gains its mother will have lost two. 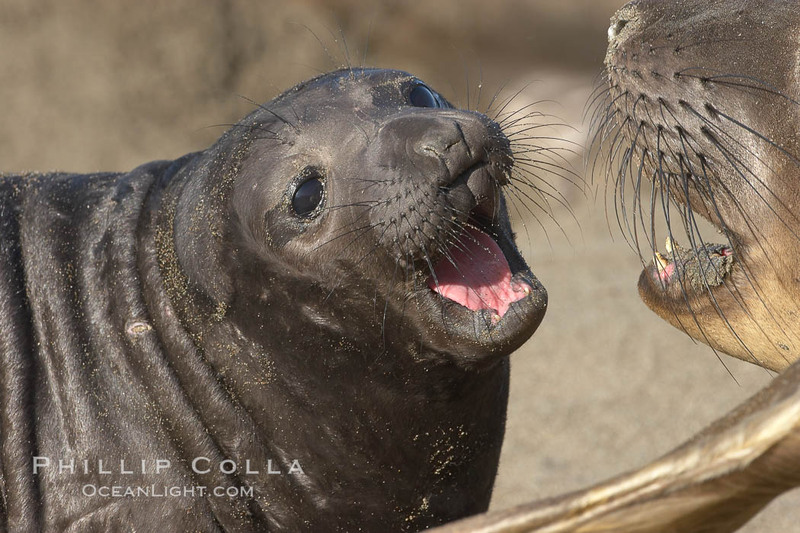 It is estimated that about 3500 pups were born at the Piedras Blancas rookery in 2005. Pups weigh up to 75 lbs. at birth and may be four feet long. When they are first born they carry a striking dark black, smooth coat which will gradually fade to brown as the pup matures. Weaning. Females nurse their pups on fat-rich milk for only 28 days. Shortly before she weans her pup, the female will mate with one or more of the mature bull elephant seals. She will then return to the ocean leaving the pup to fend for itself. At this point the 300 pound pup is called a weaner and its existence is quite precarious. It must learn to swim and forage for itself, living off its fat reserves as it does so. For two months a weaner will remain at the rookery, gradually gaining swimming and foraging skills. If it is successful and survives, it will adopt a diet of squid, fish, rays and small sharks.